Is the Bible full of contradictions which disprove its validity? Dr. David Reagan and I on our ministry's television show Christ in Prophecy had the pleasure of asking this question of Eric Barger of Take a Stand! Ministries. Eric is an authority on the cults, the New Age, and rock music today. 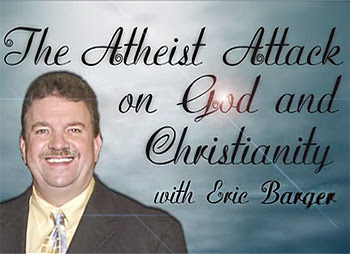 From his past as a former drug addict and rock n' roll musician who was deeply involved in the New Age movement, Eric has emerged since he gave his life to Jesus Christ to become a great defender of Christianity in America. He joined us to discuss why Atheists think the way they do. Dr. Reagan: Let me ask you this, Eric. Atheists are always saying the Bible is full of contradictions, just contradictions everywhere. How do you answer that false assumption? Eric Barger: You'll hear that argument from Atheists all of the time. Start by looking at what they say. One argument they'll use is that they'll claim the Bible isn't really the Word of God because it also has the words of demons and angels and Lucifer. And yet, God speaks in it 3,100 times. God wanted us to know about Himself and about the universe and how to interact with other men so we know what we'll be accountable for. That the Bible is called the Word of God; it is God's Word to us. It isn't necessarily God dictating to a secretary what He wanted us to know. God uses His words and others in the Bible to accomplish His revelation. Critics say the book of Daniel is out of place with the rest of the Bible, and that's a common argument you'll hear. These people will claim Daniel was written about 150 BC, but when you go back and do the research you can clearly see that this wasn't the case. I could give a long dissertation as to why, and I do so in one of my messages. Critics will also claim the genealogies are off base. There are all sorts of attacks made against the Bible. Nathan Jones: They'll try to pick it apart by pulling the threads apart, don't they? Eric Barger: Exactly, yet none of their arguments are about the substance of who God is and what He's trying to convey in His Word to mankind. Dr. Reagan: Not only is the Bible validated as the Word of God through fulfilled prophecy, in truth there is just no other book in the world that has fulfilled prophecies. The Bible has prophecies already fulfilled — hundreds of them — about cities and towns and individuals. I'm not just talking about Messianic prophecies. Dr. Reagan: Look at the field of archaeology. Archaeology is dominated by unbelievers. Nearly 98% of archaeologists in the world are people who are not believers and are determined to prove the Bible wrong. And yet, every time these archaeologists turn over a spade of dirt they find new evidence that the Bible really is historically accurate. They have to be some of the most frustrated guys on planet earth! Compare that to the Book of Mormon for example. The Book of Mormon talks about cities all across of North America and South America, but no one has found any kind of evidence that these cities ever existed. There is just no archaeological evidence whatsoever. But, go to Israel, and everywhere you walk you will find the archaeological evidence of what the Bible describes. Eric Barger: Right. Mormons weren't helped any by the coming of DNA either, because DNA proved that the American Indians from North, Central, and South America were not the children of Israel who they claimed were Jews who came to this continent. Nathan Jones: I thought this was a great example of archaeology proving the Bible that came up recently. Someone wrote into the ministry saying that they read Luke 2:1-2, "In those days Caesar Augustus issued a decree that a census should be taken of the entire Roman world. This was the first census that took place while Quirinius was governor of Syria." They asked why if Quirinius was governor of Syria in 6 AD and, Jesus was born in 4 BC, how do you explain the apparent discrepancy in dates? The answer is through archaeology. An archaeological discovery that answers this is the Lapis Tiburtinus. It's a fragment of a record from that time that pointed out that Quirinius was governor twice and that there had been someone between his first and second tenures. So, Quirinius was indeed governor during Jesus' birth. This is another example of how archaeology proves those little areas in the Bible where we are like, "Hey, wait a minute!" Dr. Reagan: Another good example is that for years archaeologists have said that David and Solomon had never existed and that they were just simply like King Arthur of Camelot. They claimed these biblical kings were just a folk story among the Jews. Later, archaeologists found a potsherd that speaks about a certain king of Israel being of the House of David. Critics will then say, "Oh, that doesn't really mean David lived." They've always got some excuse to explain the hard evidence that is prolifically there. The thing that gets me about biblical critics is that they'll find a little papyrus in Egypt, just a little piece of papyrus, and it will have something written on it which they will take easily enough as absolute fact. And yet, here we have the Bible preserved by the Jewish people as no other literature has ever been preserved, but they say the Bible's all just myth, legend and superstition. Eric Barger: The city of Hazor, which was called the king of the pagan settlements, it was a very important spot in Israel as far as typography goes. Two of the prophets prophesied against it. Jeremiah said that no one will ever live there again. And, no one has ever lived there since. Hazor has to have more snakes and vipers living there as it says in the Bible than anywhere else, and it does. Dr. Reagan: For years, one of the major attacks on the Bible was that it mentions Hittites. Critics said there was never such a people who ever existed. But then, archaeologists found the whole civilization of the Hittites. Critics also as late as 1800 were writing books saying the New Testament is full of myth, legend and superstition because it says Jesus spent 3 1/2 years of his ministry primarily in three towns: Capernaum, Korizan and Bethsaida. These critics claim these cities have never existed. But then, in the middle of the 19th Century the archaeologists found all three towns. Eric Barger: The Atheist were counting on the idea that King Solomon wasn't as smart or as influential as the Bible says he was. They claim he couldn't possibly have had a thousand horses and chariots stabled in one place. But then, in 1945, archaeologists found the stables and took pictures of them. Dr. Reagan: I've even been to those stables. Eric Barger: By the way, that discovery stopped the Atheists. The stables became an argument they took off the table. They couldn't use it anymore, but it was their main argument before 1945 against the Bible. Nathan Jones: Eric, one question I get all the time, and this one is really sad. A mother wrote in concerning her daughter who had grown up in the Church and in the faith, but when she went off to college she met a guy who's an Atheist. All he had to say to the daughter was, "Constantine picked what books out of the Bible he wanted and got rid of the rest." Now she's joined him as a meth-head because she's lost her faith. How do you deal with people whose faith is so fragile that all one has to say is, "Constantine got rid of all the books that didn't match what he wanted?" People's faith then crumbles. Is that true? Did Constantine get in there and play with what books he wanted? Eric Barger: No, Constantine had nothing to do with the formulation of the Bible. The canon was all compiled well before his birth. Nathan Jones: Which was what, 300 AD or so when Constantine ruled? Eric Barger: Yes. Between 140-170 AD was when the Church was deciding they needed a standardized set of teachings that the Church could use in all quarters that they could refer to as the written set of teachings. Until that time, even though the letters of the Apostles were circulating, there wasn't a standardized set of teachings before the Muratorian Canon came out, and that took 30 years for them to put it together. They didn't go to the coffee shop one day and say, "Well, boys, I think we've got it." No, these biblical scholars took 30 years to make sure that they had the confirmed teachings of God. They included all but three of the books of the Bible that we have in the New Testament today. Dr. Reagan: When most churches today seem to have youth programs aimed at fun things and never spending any time on Bible study, what more can we expect when our kids go off and have their faith challenged. They don't know how to defend anything. Eric Barger: I agree. This is one of the Church's biggest contemporary problems. Our kids are being forced fed Evolution and Agnosticism and that all is well with the sinful lifestyles of others around them. Every day we hear these stories, and yet our youth pastors are too afraid of the kids not wanting to come back, so we have to have something fun for them. But, where is the study? We can't expect a half hour Bible lesson on Sunday morning to be an antidote for 40 hours of schooling which the kids are getting in our secular schools today, especially with the curriculum being so liberal like it is.